I have been keeping bees for several years, but still consider myself a new beekeeper. So much to learn. I have noticed the bees doing something in the hives, and wonder WHAT ARE THEY UP TO? I have noticed that at times they will hang between the frames with their legs hooked together, as if they have made a chain. Can you tell me what they are up to? 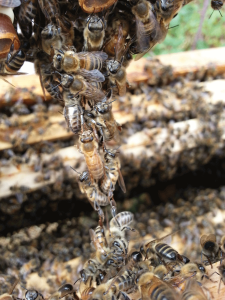 A: Though it may not look like it, what they are up to is helping to build bees wax comb. It’s such a common practice that we have a name for it. We call the chain of bees a festoon, and refer to the behavior as festooning. To understand the reason for it requires a little knowledge of honey bee anatomy. Although the fine hairs on their bodies make them look soft and fuzzy, honey bees, like all insects, have an exoskeleton. In their case, the exoskeleton takes the form, not of a solid carapace, but of a series of plates. If you look closely at the underside of a worker bee’s abdomen (be careful – this is also where her stinger is located), you will see a series of individual plates. Between and under the fourth through the seventh plates is where her wax glands are located. From these, she produces wax at will, but usually only during a certain phase of her adulthood. Honey bees have a short lifespan, about five to six weeks for those emerging in the Spring through early Fall. In that brief period, workers perform a progressive series of tasks, culminating in the roll of forager. Wax production and comb building are age specific duties which take place when the bee is between about 12 and 25 days of age. The wax is secreted in the form of small flakes. She uses her legs to move them up to her mouth where she shapes them into perfect hexagonal cells with just a slight inclination downward from the opening. How honey bees form comb with such precision is one of nature’s mysteries, but if you ever played with Play-doh as a child and had to roll it around in your hands and squeeze it until it became malleable enough to shape, you’ll understand why temperature is an important factor in the process. That’s where festooning comes in. By hooking together and forming festoons around the construction site, the bees can maintain it at about 95ºF – the ideal temperature for comb building. Even though it is a common behavior and you have been keeping bees for several years, it is not really surprising that you have never seen it before. In the first place, festooning is a factor in only about half of all comb constructed. 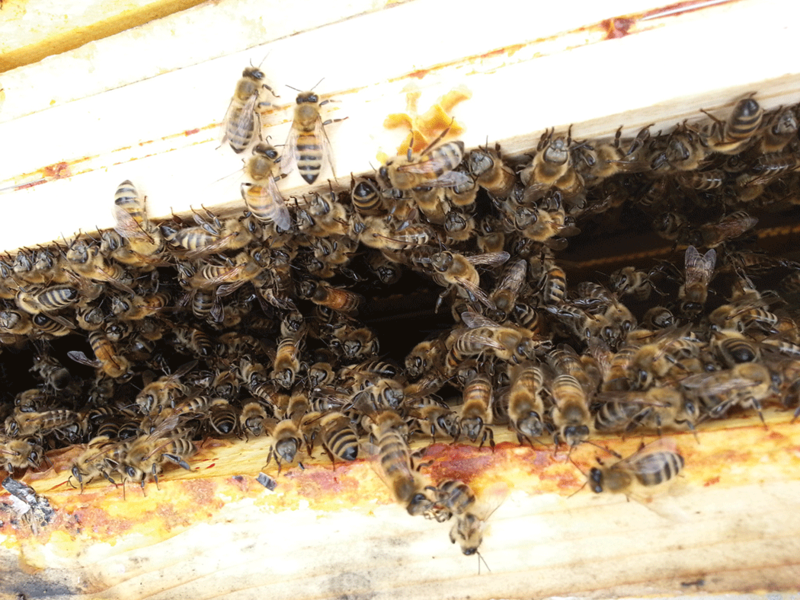 In a closed hive in the Summer, daytime temperatures can easily reach the nineties and above, so festooning is unnecessary. You would have had a better chance of seeing it before now if you were in the habit of inspecting your hives at night. Temperature goes down with the sun, but work in the hive does not stop. After a long day of collecting nectar and pollen, foragers are available to work the night shift in festoons while younger sisters work in production. It has been a long, hot Summer in Kentucky, but I recently saw some festooning while visiting a beeyard during a trip to France. It was early September, but temperatures were already starting to drop there. There was a nectar flow on, and the hive where I saw the festooning was missing an end frame. The bees had obviously decided that they needed another comb to store incoming nectar. I speak no French and the apiarist knew only a little English, but we pointed, nodded, and smiled. For those of us who have been captivated by the little insects, beekeeping is a universal language. We are told in Africa that the stings from honey bees will help cure disease, including malaria and typhoid fever. Is this true? A: In the United States there is a branch of alternative medicine known as apitherapy. It includes not only the intentional administration of bee stings, but also the beneficial health effects of honey and other products harvested from honey bee hives, including pollen and propolis. Though stings are often applied directly, bee venom can also be harvested from bees by an ingenious method. A grid is attached to the hive entrance and an electric current passed through it to induce the bees to sting without impaling their stingers. That way they are not killed. The venom collects on a glass plate placed under the grid and is allowed to dry before being collected in the form of a powder. To see a video of the procedure, go to http://www.youtube.com/watch?v=SGQso0dWwy8. Harvested bee venom can be used in an injectable form, or as a cream or ointment, in the treatment of rheumatoid arthritis, nerve pain (neuralgia), multiple sclerosis (MS), tendonitis, and muscle problems. 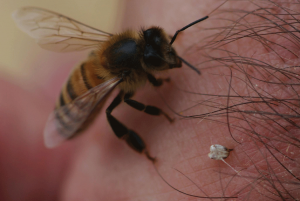 It is also used to reduce the reaction to bee stings in people who are extremely allergic. Some victims of Lyme disease have benefited from bee venom therapy. Lyme disease is similar to some of the conditions cited above in that it affects the nervous and muscular systems. I have even read of research with some of the components of bee venom which indicate that it may someday aid in the prevention of HIV infections. However, when it comes to diseases such as malaria or typhoid fever, I know of no research showing that bee venom is beneficial. With regard to honey, many people find that daily consumption of small amounts just makes them feel healthier. It is used to relieve coughs, either alone, or as an ingredient in cough syrup. Honey is also said to provide relief for those suffering from asthma and hay fever, stomach ulcers, and diarrhea. Some of the components of honey have antibiotic properties which aid in the healing of wounds. For that reason, it has a long history of being applied directly to injuries of the skin to promote healing. The Greek physician Dioscorides used honey in the treatment of sunburn and skin wounds. Reference to the medicinal use of honey can be found in the Bible, Koran, and Torah. 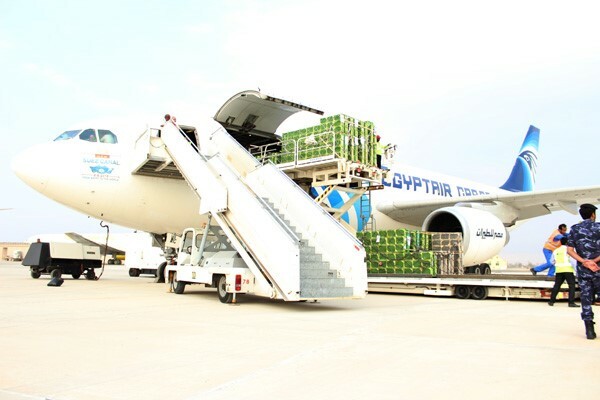 Today special bandages are available which contain medical grade honey. One particular varietal, Manuka honey from New Zealand, is especially prized for its healing properties, and is said to have four times the antibacterial effects of other honeys. Some claims of the medicinal benefits of bee venom and bee products are well researched and documented; others are merely anecdotal. Probably not all are true, but if you think beestings can help, it doesn’t hurt to try, right? Or, ouch, maybe it does. I’m looking into starting up a couple of hives in a year or two, and as all newbies, I have a ton of questions. Here are the first ones. Question 1: The queen gives off pheromones which lets the bees know she is still around (over simplified), but if you put hives side by side, how do the bees know which hive is theirs? 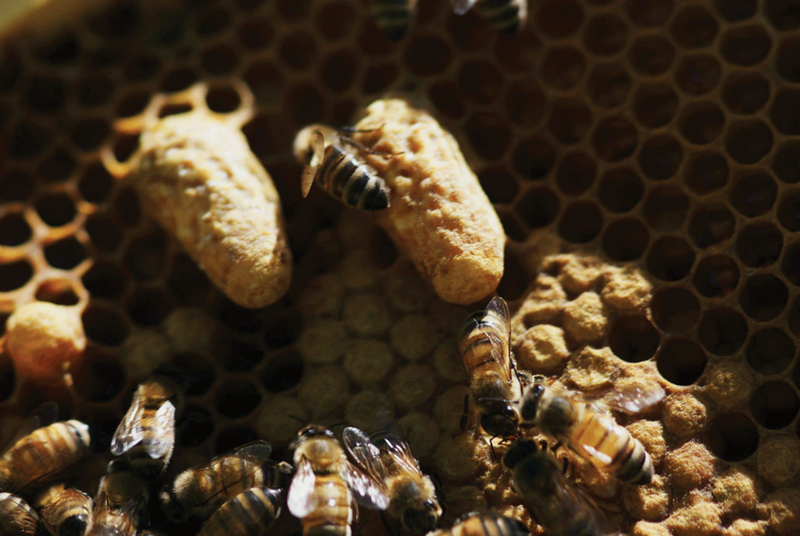 A: Each hive has a distinctive ‘smell’, that is due not just to the queen’s pheromones, but also to other brood and bee pheromones and to the unique collection of stored ‘stuff’ in the hive, such as honey, pollen, propolis, etc. Even so, bees do sometimes end up in the wrong box. We call that drifting. Drones have an especially bad reputation about this. Women beekeepers tell me that guys get lost more often because they will not ask for directions. I am not aware of any conclusive research on the subject. Question 2: Would the hive be confused if an active hive is next to it? Do the bees go from one hive to another and then back? A: Though drift does happen, bees do not return randomly to first one hive and then another. A honey bee that flies into the wrong hive is normally accepted into the new colony, especially if she is returning from foraging trip with a load of nectar or pollen. She becomes a part of the new colony and accepts it as her new home. In nature, colonies of honey bees would never be as close together as beekeepers place their hives in apiaries. Wild colonies would be hundreds of yards apart, at least. I have 20 hives in one location. Though it would most likely be healthier to have them spaced well apart, it would not be as convenient for me when I inspect the hives or collect honey. Question 3: If a queen dies, how long until a new queen is developed? A: It takes about two weeks for a colony to produce a new queen, providing that it has a young larva, only a day or two days old, which it can raise as a queen. Once the new queen emerges, it can take another two weeks or more for her to get mated and start laying eggs. Question 4: The bottom is the brood box and the queen is “trapped” there. Is it best for the first few years to leave a second box on top of it, strictly for supporting hive growth? A: We call the boxes which contain the queen, and where the colony rears new bees and stores Winter supplies of honey, brood boxes. The number of brood boxes which comprise a hive is a factor of how much food has to be stored for Winter. 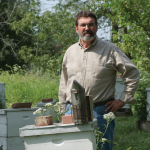 Beekeepers who enjoy the mild Winters of the deep south get by with one brood box, but in most of the country two is the norm. I live in Kentucky, which is considered the upper south, and I use two brood boxes. In Minnesota you will need at least two, and maybe three. More boxes not only provide room for winter food stores, but also housing throughout the year for the bees that forage and gather the food. Check with local beekeepers, or the folks at the University of Minnesota Honey Bee Lab about requirements for your specific region. Question 5: Once you have honey, would creating a “hot box” out of plexiglass to set the racks in and letting the sun heat the honey off the racks a simpler way to remove it? This way the rack would not be subjected to unnecessary abuse and retain a little honey residue to rebuild it. A : No. Unless you could control the temperature in the box precisely, you would melt the wax, make a mess, and kill the bees that would be trapped in it. And it would result in robbing. Unfortunately, there is no easy way to take honey off. Question 6: I seen videos of a hive where they put the honey directly in the jars to sell. I have heard that the honey is naturally free of contaminants, is this a true statement or mostly true? A: There is a hive design that makes this claim. It is new on the market, and I will reserve judgement about its effectiveness in the field until it has been in use for a couple of years and I have heard from beekeepers who have used it. See the answer to question number 5. Question 7: How large of an area for flowers would I need for flowers to maintain a hive? ½ acre, one acre, two acre or too much to worry about? A: Don’t worry about it. 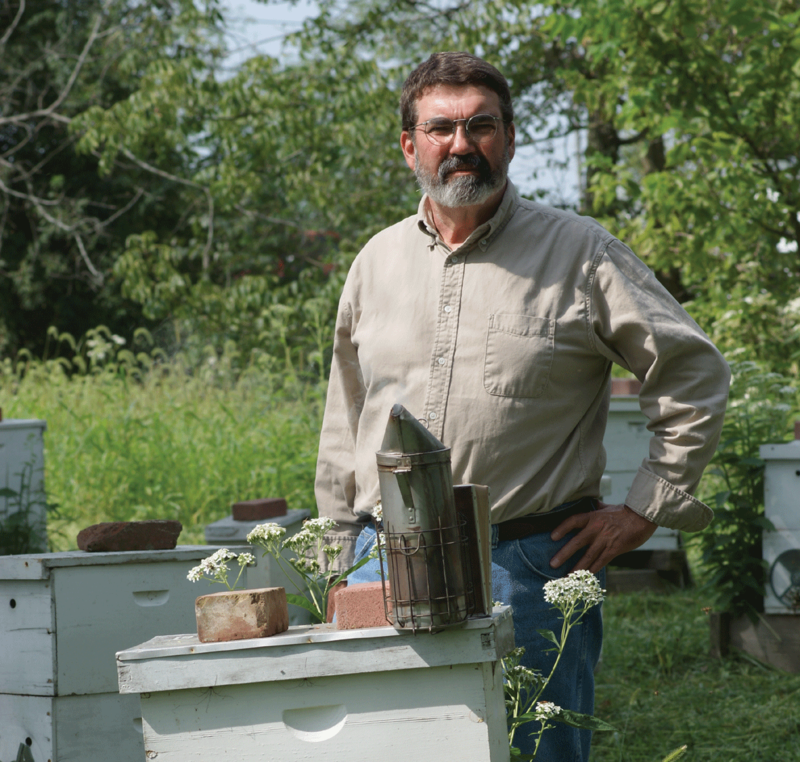 Bees can find forage in most places in the U.S. Minnesota is actually a VERY good place. Bees will fly about three miles to collect nectar. Question 8: I am in Minnesota. In wrapping the hive for winter, can you wrap it too much, retaining too much warmth? A: Hives are only wrapped in the more northern parts of the country, and that includes Minnesota, but it MUST be done correctly. The concern and danger is the accumulation of moisture under the wrapping. We are always concerned about moisture in hives – especially during Winter – whether they are wrapped or not. 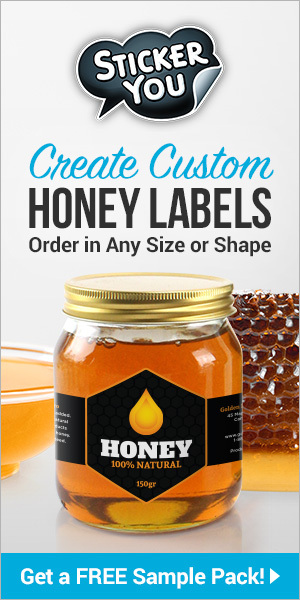 For a new beekeeper the simplest solution is to purchase a commercially designed hive wrap, designed for one hive, and install it according to the directions. Thanks for some interesting questions, and good luck.